FILE - People protest for increased minimum wages outside a McDonald's restaurant in the Little Havana area in Miami, Florida, Dec. 4, 2014. Even though partisan infighting made Congress virtually ineffective in 2016, a spate of new laws were still approved and will go into effect next year. Nineteen states, including New York and California, will ring in the year with an increase in the minimum wage. The increase in pay, for some of the lowest paid U.S. workers, will mean most for workers in Massachusetts and Washington state, where the minimum wage will go up to $11 per hour. California will raise its wage to $10.50 for businesses with 26 or more employees. New York state is taking a regional approach, with the wage rising to $11 in New York City, to $10.50 for small businesses in the city, $10 in its suburbs and $9.70 elsewhere. FILE - New York Gov. 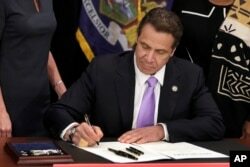 Andrew Cuomo signs a law that will gradually raise New York's minimum wage, April 4, 2016. New York joins 18 other states by raising its minimum wage in 2017. Voters in Arizona, Maine, Colorado and Washington approved increases in this year's election. Seven other states, Alaska, Florida, Missouri, Montana, New Jersey, Ohio and South Dakota, are automatically raising the wage based on indexing. The other states seeing increases are Arkansas, Connecticut, Hawaii, Michigan and Vermont. Voters also approved the use of marijuana in several states. Revelers in California and Massachusetts can now ring in the new year with a glass of champagne and a joint. Nevadans and Maine can join the party soon after that. Recreational marijuana use is legal in Nevada on January 1, but the state still has to establish the infrastructure to buy and sell it. In Maine, voters approved legalizing recreational marijuana. The governor hasn't signed the bill yet — he has until December 31 — but even then, the law doesn't go into effect for 30 days. Ailing residents of North Dakota, Florida, Montana and Arkansas will now be able to use marijuana for medical purposes. In Illinois: It will be legal to catch catfish using a pitchfork, a speargun or a bow and arrow. Women will no longer have to pay a 6.25 percent "luxury" tax on tampons. In California: Gun owners will be no longer be allowed to purchase semiautomatic rifles with “evil features” such as pistol grips, flash hiders and buttons that make it easier to remove and replace ammunition magazines. In Utah: Online retailers will have to charge shoppers a 4.7 percent state tax at the point of sale. In Tennessee: Beer lovers will celebrate as brewers will be allowed to make higher alcohol content brews without a specialty license. The new law increases the alcohol by volume limit from 6.2 percent to 10.1 percent.